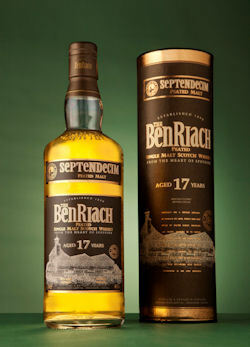 BenRiach’s Septendecim, its newest addition to its celebrated peated range, will be available worldwide later this month, the distillery announced today (19 January 2012). The new 17 year-old has been matured only in ex-bourbon casks and continues BenRiach’s quirky trend of using Latin names – such as Authenticus, Curiositas and Heredotus Fumosus - for its richly-peated expressions. The tasting notes confirm Septendecim – Latin for “seventeen” - is a magnificent, multi-layered malt with fantastic length. The colour is rich summer gold with a freshly harvested barley impression. On the nose, it’s full of energy and vibrancy - a complex mix of fresh peaty aromas constructed around a central core of apples and toasted nuts dowsed in wild mountain honey. And on the palate, it gives sweet concentrated peat flavours which dominate from the start. Bold and intense, the peaty heart is united with honey-infused raisins, roasted nuts and a luxurious leather impression. Peated malt whisky production only represents approximately six weeks’ worth of the annual production at BenRiach, but the peated whiskies have become an important part of the distillery’s product portfolio as they offer something unexpected from the Speyside region. Septendecim is non chill-filtered and bottled at natural colour, with a strength of 46% vol. Unlike the recently-launched BenRiach Solstice, the Septendecim is not a limited release and should be continually available for years to come. Picture shows Septendecim and its packaging.